These gorgeous 4mm round amethyst scroll setting stud earrings from Apples of Gold Jewelry combine a beautiful, rich purple amethyst gemstones, which are rated AA and genuine, with a 14K white gold earring. 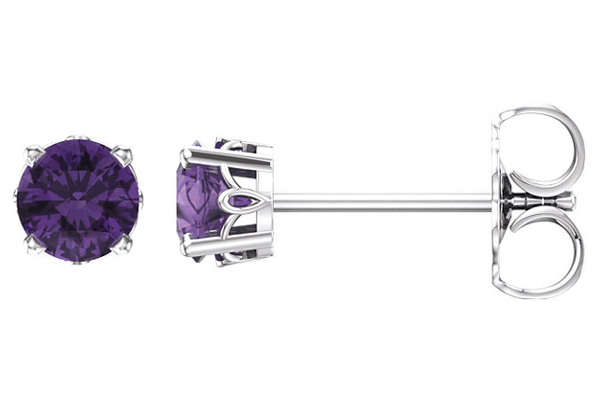 The 14K white gold of the earrings look stunning when combined with the deep purple of the genuine 4mm amethyst gemstones, which are cut into a lovely round shape. Each earring features a scroll like setting, and friction push back closure posts help keep the earrings securely in place during wear. We guarantee our Amethyst Scroll Setting Stud Earrings to be high quality, authentic jewelry, as described above.